Stay Smart at Our Hotel in San AntonioWhether you're here for business or pleasure, you're sure to enjoy everything San Antonio has to offer. With a rich and colorful history, San Antonio has established itself as one of the Southwest's top destinations with tons of shopping, dining, fun attractions, events and festivals.The Holiday Inn Express is a great hotel by San Antonio airport, making it convenient for quick trips to the city that don't allow time for a long commute. We're also convenient to companies like Valero Energy Corporation, Whataburger and USAA. You can also use our North San Antonio hotel's 24-hour business center to help polish a presentation, and even host an event in one of our large meeting rooms.There is so much to do and see in San Antonio. Some of the more famous landmarks include the Alamo, the downtown Riverwalk and SeaWorld, but there are also places like the San Antonio Zoo, McAllister Park and Six Flags Fiesta Texas that warrant a visit. Our hotel in San Antonio is near many of these attractions, as well as world-class dining and shopping at places like North Star Mall and the Alamo Quarry Market.No matter what brings you to this historic city, our North San Antonio hotel's staff and excellent amenities like an outdoor pool, 24-hour fitness center and free Express Start will help make your stay comfortable. 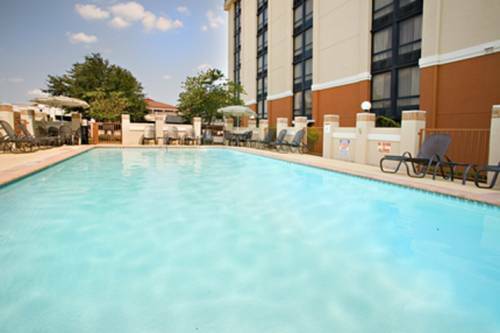 Make your reservations today to enjoy everything our hotel in San Antonio has to offer! North Star Mall is one of San Antonio's premier shopping destinations. The mall features upscale shops and restaurants to suit every shopper's whim.